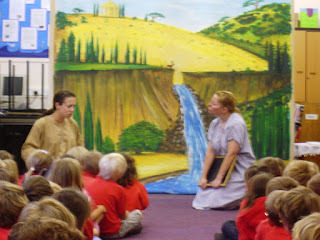 No sooner had the Autumn term begun on the 2nd September than we found ourselves driving to Birmingham the very next day to perform our ever popular "The Story of Aesop's Fables" to a lively bunch of 4 to 11 year olds. My, those Foundation Stage kids were tiny! The long journey proved useful as the actors were able to do a line run on the new Robin Hood play while I had the easy job of dealing with the motorways! I guess we are back in the thick of it now as the phone is melting and the emails are pouring in. Our two plays for the young, "Billy Beware!" and "Not such an Ugly Duckling" are in demand, particularly as schools and nurseries are responding to the Government's "anti-bullying" and "safety" initiatives. At this rate I shall be lucky to find the time to write any more.